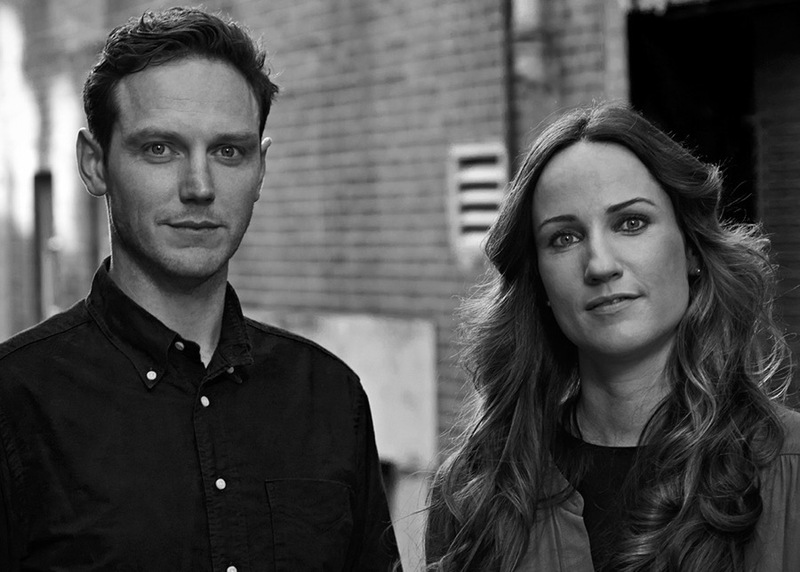 The Creatives is Bernhardt Design’s ongoing initiative to collaborate with people outside the traditional world. In The Creatives, Part 3, we introduce you to Tift Merritt and the Tift Merritt Collection. 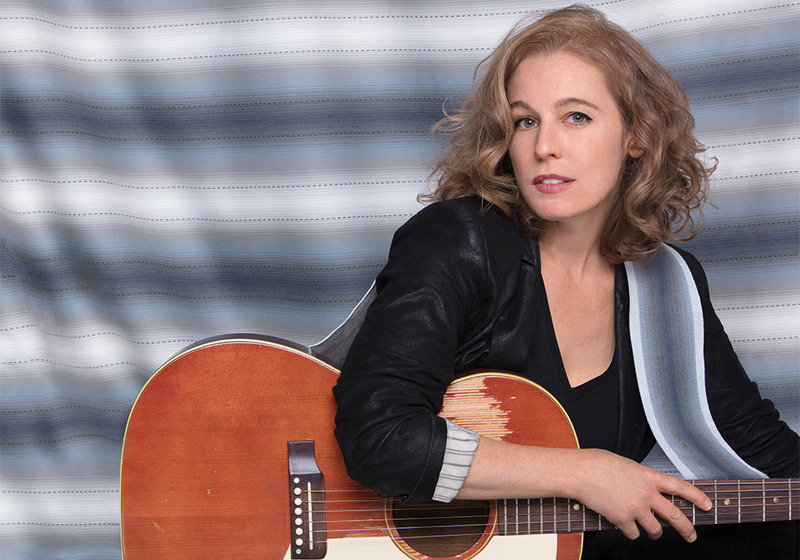 Tift Merritt is a Grammy-nominated singer, songwriter and musician who hails from Raleigh, North Carolina. Throughout her 20-year music career Merritt has travelled across the States and the world collecting textiles as small souvenirs to take home. Now what started as a hobby has transformed into a line of textiles as Merritt has collaborated with Bernhardt Design to create a vintage ribbon-inspired fabric collection. 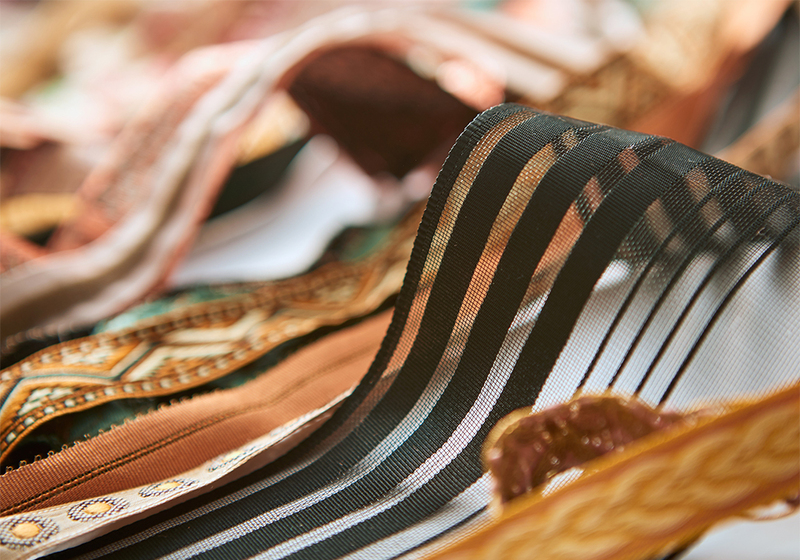 Vintage ribbon is Merritt’s favourite textile, which she appreciates for its exceptional detail and craftsmanship. 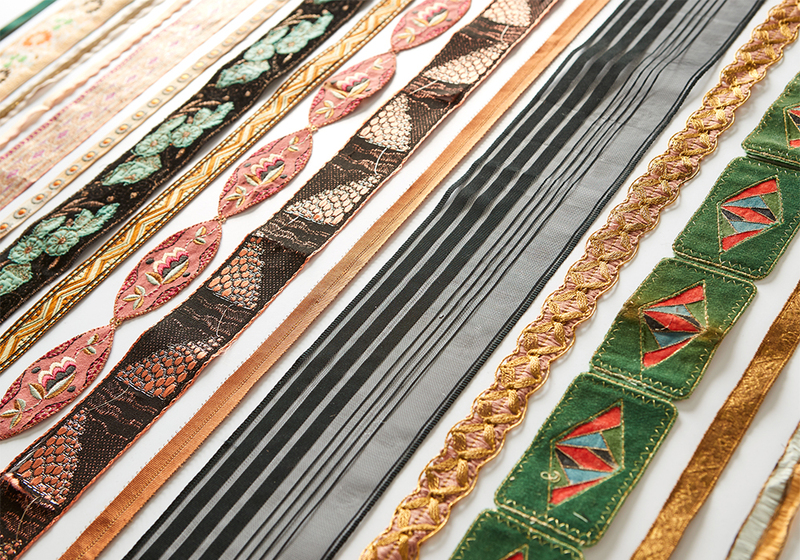 In recent years Merritt has taken to personalising guitars she has acquired, crafting custom guitar straps from her collection of vintage ribbon. “I have always been driven by a desire of how to incorporate the elegance of vintage craftsmanship in a modern design vocabulary,” Merritt says. Merritt created her collection without the use of a computer. Instead she used a photocopying machine to invert, subvert and reverse patterns; placed ribbons alongside each other to play with smooth and chunky textures; experimented with supple leather; and explored scale and repetition. “It was important to give voice to the seams, the knots, and to amplify the spatial difference in a velvet and lace stripe,” Merritt says. 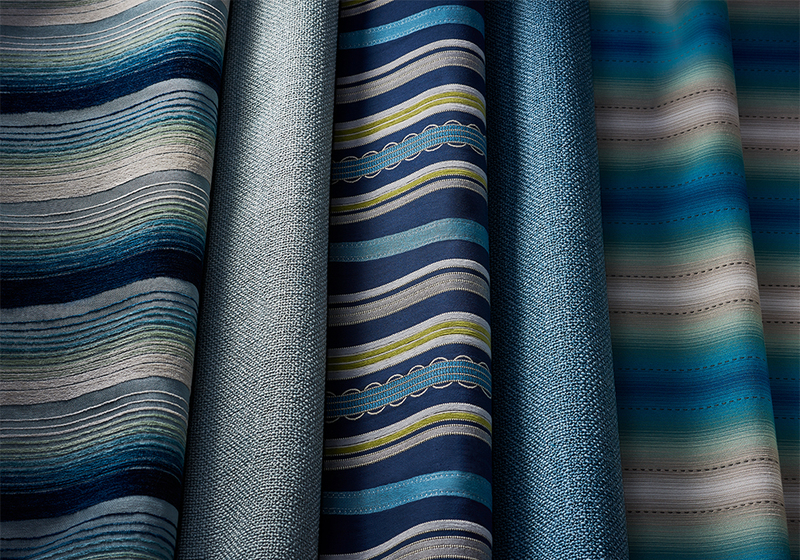 The result is a collection that features six designs ranging from vibrant stripes to complementary solids. The textiles are available in 51 colourways and Merritt has appropriately given them music-inspired names such as Cadence, Forte, Reverb, Solo, Swing and Verse. Cadence, available in four multi-coloured options, is inspired by an antique ribbon from Paris with a variety of ascending and descending stripes.Forte mimics the structure of grosgrain ribbon and offered in eight solid textures it is constructed of a unique multi-colour boucle novelty yarn. Merritt reimagined the vibrations of acoustical frequency in the form of a visual colour gradient for Reverb. It reflects the texture and shadowing of layered leather strips and is woven from an intricate structure of soft denier yarn, accentuated with a defining stitch. Colourful Solo is a solid texture offered in sixteen hues that complement the overall collection. It is a non-directional textile constructed of a hefty single-ply acrylic yarn. Like the words and phrases joined together in a verse of poetry or song, Verse is inspired by vintage ribbons in multiple sizes, colours and thicknesses. 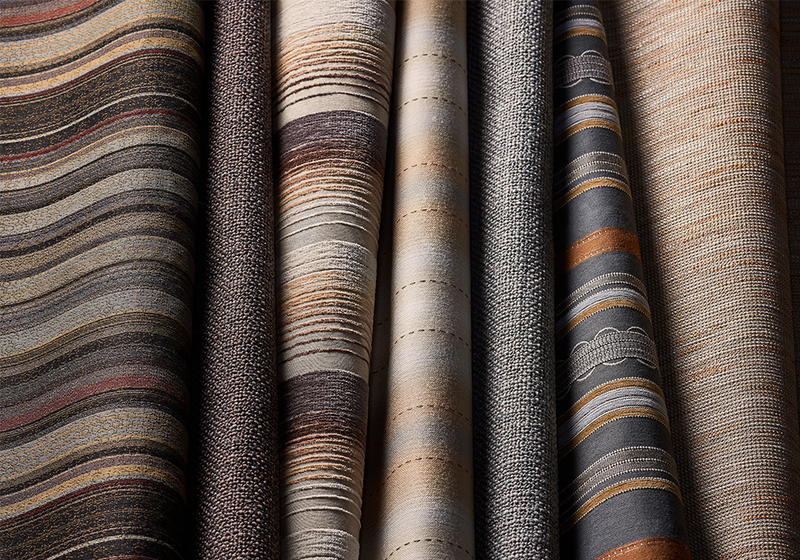 A variety of different yarn types were woven onto a recycled nylon background to create interesting textures within the stripes of the six colourways. Learn more about more 'The Creatives' collaborations via the links below, or drop by the KE-ZU showroom in Alexandria to check out the Bernhardt Design collection.